There are so many little things to keep track of when you are sewing! Who doesn't need a jar to keep buttons, thread spools, or a sewing kit in. Plus there is a bonus pin cushion on the lid as well. 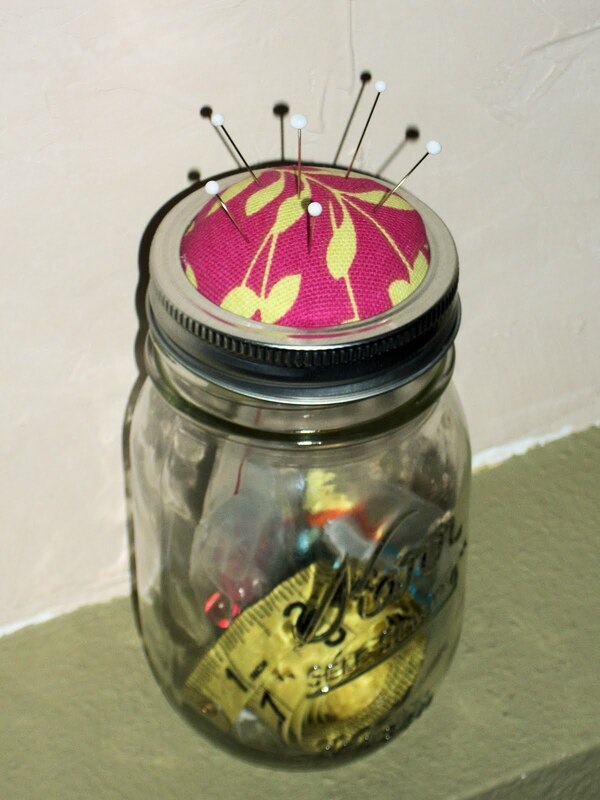 You will need a mason jar, material scrap, polyfil, and a glue gun. Cut a circle of material about an inch wider on all sides than your lid circle. Fold the material over and glue to the under side of your lid. Continue gluing around, bunching the material up as you go. Before gluing the final side, stuff the polyfil under the material to create your pin cushion. Put a line of glue on the underside of the lid rim. Snap the inside lid back into place and allow the glue to dry.